Dodging the Bullet: King Lear Proves College Theater Builds a Community | The Gettysburgian. The lights shine on you, but everything around you is dark. A thrill of jubilation rises inside your heart even as thousands of butterflies migrate to your stomach. This dichotomy of emotions and the juxtaposition of the real and the imaginary are what draw me to theater. Home videos provide the evidence that I’ve been performing since I could first walk and talk, and so I’ve been involved in theater for as long as I can remember. Many plays and high school musicals later, I made it to Gettysburg, where I enrolled in a first-year seminar on multicultural theater in the United States. Given my love for the stage and my passion for Shakespeare (natural, perhaps, as I am thinking of a major in English), it is easy to imagine my elation when I discovered that our Mainstage production for the year is Shakespeare’s King Lear. I didn’t think twice before signing up to audition. I was thrilled to see my name on the cast list and was immediately ready to dive in to rehearsals. In high school, rehearsals were generally pretty short; they were either very stressful or so unruly that nothing was accomplished. They were irregular, and cast members often skipped out because they figured they were not needed. Indeed, while some people were devoted to the productions, many participated just to add something to their Common App resumes. To my relief, I’ve found rehearsals here to be far different. 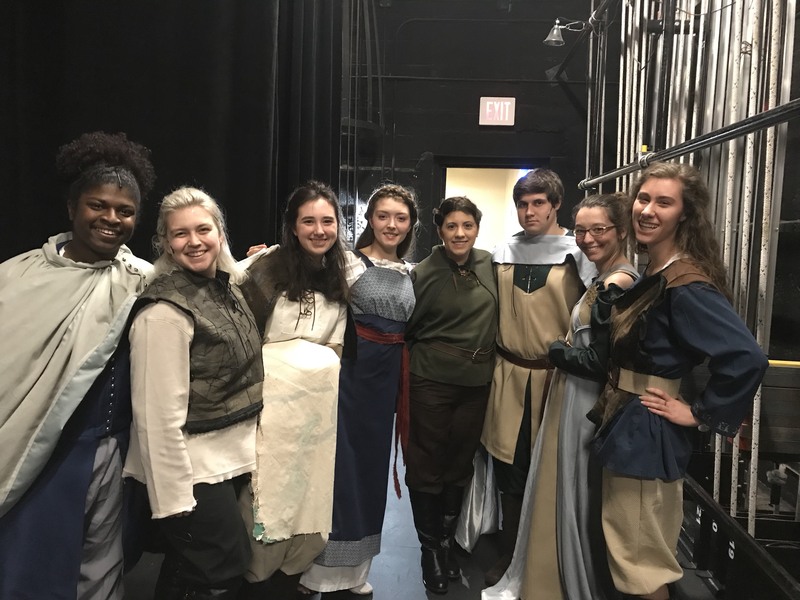 For one, people actually care about the play; many participating are Theatre Arts majors or minors, and everyone seems excited to rehearse every day and create a great show. Of course, rehearsals are much more of a responsibility; generally they run from 4-7 every weekday, and this can sometimes be less than ideal with needing to attend night classes and eat dinner, but the cast understands that they have made a commitment and do not skip rehearsal just because they don’t feel like coming. In fact, many cast members had to come back to campus a week early from winter break to participate in 60 hours of rehearsal to get the show on its feet. While I was unable to return early, I definitely feel the sense of community that spending so much time together creates. Everyone in the cast is so nice, and while they do take rehearsal quite seriously, there is still a sense of fun every day. I am thrilled to have met so many new people and made new friends even as a first year. In high school too I made new friends through the productions I was in, but these friendships often seemed superficial—you’d hang out at rehearsal, but once the final curtain dropped, you’d hardly acknowledge each other in the halls. I can already tell, however, that here it will be different: already I’m saying hi to castmates I pass on campus, and most days after rehearsal, many of us head to Servo together. Though King Lear is about mistakes and conflict, my new friends and I are coming together to create something exciting and unifying. We will be performing March 1-4 at the Majestic Theater, and we hope you’ll come out and enjoy the show!